Airflow is the lifeblood of any PC. And planning out your airflow can save you grief in the long run. The clearest advantage is better operating temperatures. Better temperatures translate into longer lasting hardware and higher performance. By contrast, higher temperatures are what’s usually responsible for the death of electronics. They put a performance cap on your equipment, as your CPU or GPU start to throttle under excessive heat. Even a high-end motherboard, something in the range of $200, will often only offer a handful of fan headers. Even for people fortunate enough to have four ports, those ports are often wantonly spread across the motherboard. It’s a cable management nightmare, especially for a smaller case, or a case where you’re concerned about aesthetics. From a purely practical perspective, if you’re using bigger case, you’re probably going to be using more cooling. And after you start to use more than a couple extra fans, you’re quickly going to run out of fan headers. All of these problems go away with the right fan controller. Depending on your needs, that fan controller might be the least expensive component in your PC. Fan controllers work by routing all your fan connections through one central hub. Because they meet at one access point, this often gives you the opportunity to control your cooling in a hands-on way. Depending on the sophistication of the fan controller, you may be able to control the fans individually, or even program in groupings of fans. The bare minimum number of headers to expect from a fan controller is six. 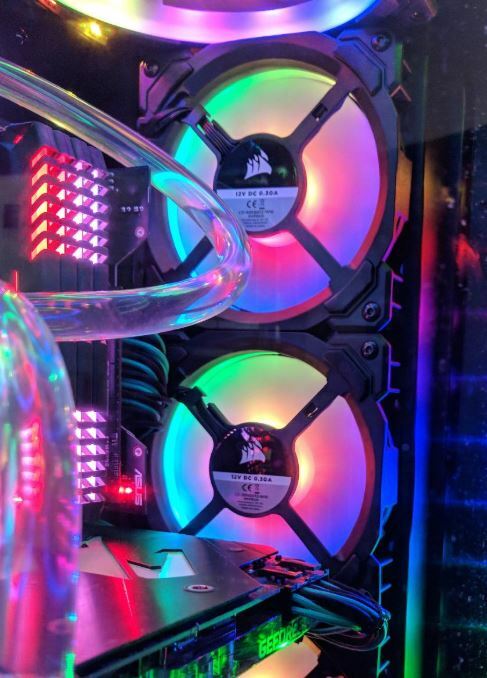 Unless your build is quite large or unusual, a full tower PC will rarely use more than six fans. Of course, some people do use unusual builds. You might have two separate fans on your CPU, like is common with some of the top end Noctua CPU coolers. An extra fan here and there can quickly add up to a whole lot of fan headers. For instance, you might want to run your GPU fans through your fan controller. For people who are going the extra mile, you’ll want to look for as many as 10 fan headers on a single fan controller. 3-pin fans are a dying breed. Developers have moved on to a 4-pin design, with the 4th pin helping the fan communicate information about how fast to run the fan. This 4th pin means you can configure fan speed on the software level, something referred to as pulse-width modulation (PWM) control. In short, it allows you set up fan profiles that will speed-up and slow-down depending on your current cooling needs. You can switch between effective heat dissipation or quiet operation, and never have to press a button or turn a knob to achieve it. 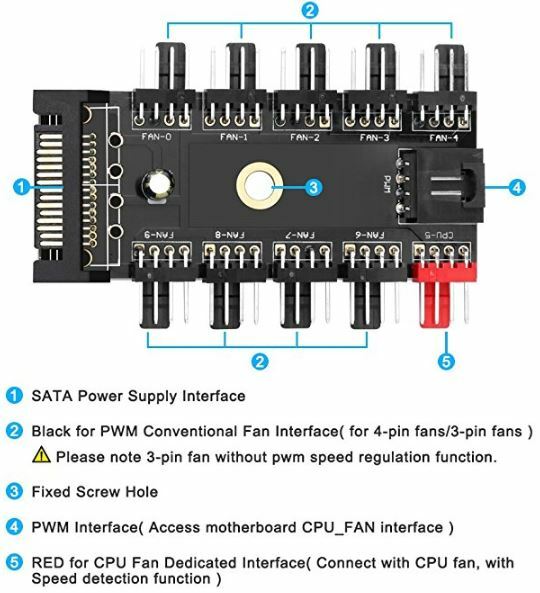 Additionally, 3-pin fans are backwards compatible for 4-pin slots, so if you’ve got a bundle of 3-pin fans, you might still want a 4-pin fan controller. 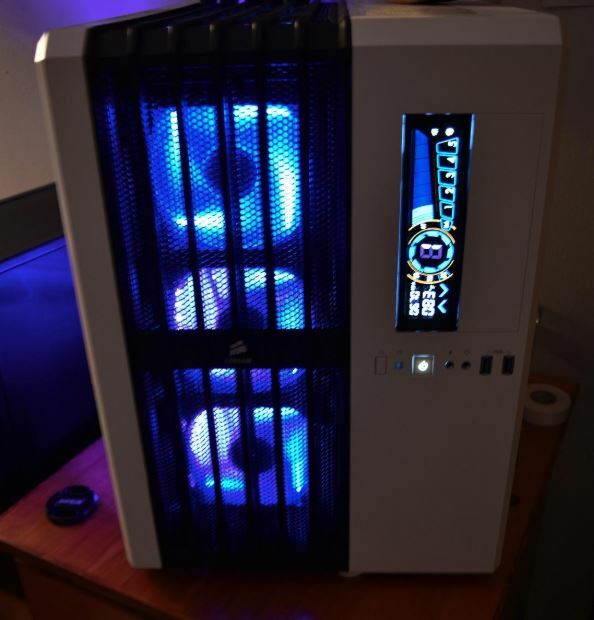 Over the past five years, case windows on PC cases have become insanely popular. Unsurprisingly, people who spend thousands on their PC equipment sometimes like to look at it. This has increasingly become the case since virtually every computer component is now manufactured with a smattering of LEDs. If you don’t care what the inside of your chassis looks like, you can probably save at least $20 by choosing a highly utilitarian fan controller. It will look like you’re shoving bare circuits into your computer. But if you’ve got a windowless case, that shouldn’t bother you. The Commander Pro is hands down, the best of Corsair’s current lineup of fan coolers. It supports six fan ports, each using a 4-pin design for PMW control and voltage adjustments. The Commander Pro also has four temperature inputs, and two RGB LED channels. For anyone who runs temperature inputs or RGB lighting in their case, it makes sense to route those connections through the same place. And the Commander Pro helps you do just that. The physical control unit sits at 5.2 x 2.7 x 0.6-inches, fitting nicely anywhere a PCI card would be able to slide into. The Commander Pro easy fits into even the smallest cases, and doesn’t have much of a material footprint, weighing under 4 ounces. Unlike an analogue fan controller, there aren’t any knobs or switches to toggle on the Commander Pro. It’s operated entirely through software. So you can place it within your case and forget it exists, essentially. And the simplified cabling it provides makes the Commander Pro help provide stealth to your entire case, getting wires out of the way with ease. Being able to set fan speeds individually means you don’t need multiple hubs, or separate PWM cables for each fan. And as a bit of an added bonus, the Corsair Commander Pro includes two internal USB 2.0 headers. For people who are building in particularly small cases, those headers can be a very welcome addition to your system. Apart from routing your fans, RGB lighting can be synchronized for both RGB fans and RGB LED strips. 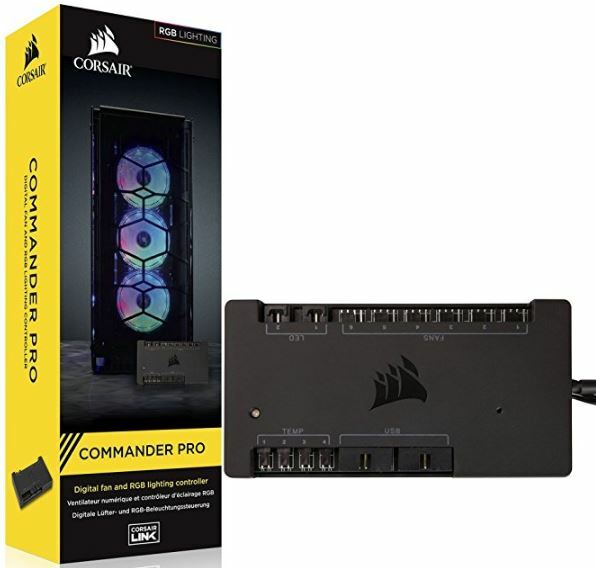 The Corsair Commander Pro has a maximum of 4 RGB LED strips per channel, and a maximum six RGB fans through one of the RGB LED hub ports. There are also four thermistor inputs, which are useful for monitoring the heat at various points in your system. Are you worried your hard drives might not be getting enough airflow? You can find out in seconds. People tend to have mixed feelings about Corsair’s control software. And there’s no denying that the RGH setup can be particularly confusing because of the multiple hubs involved. But if you can carefully follow directions, you shouldn’t have difficulty setting up your lighting just the way you want. This kit includes two RGB LED hub cables, four thermal sensors and fan extension cables, mounting tape, and a quick installation guide. It almost goes without saying, but in order to make use of the USB 2.0 header, you’ll need a motherboard that can support USB 2.0. Some people don’t need a fan controller with multiple sets of RGB headers and temperature runners. When you break down a fan controller to its most essential tasks, it really just needs to allow you to operate several fans. The Electop Chassis Fan Hub CPU Cooling Hub supports an impressive 10 headers for 4-pin PWM fans. This SATA-based controller doesn’t lock up a PCI slot, and generally stays out of your way. The Electop Fan Controller sits at 3 x 1.9 inches, with the tiny width of a computer circuit board. Although the Electop controller isn’t going to win any beauty awards, simplicity does have its advantages. In the center of other device, you’ll find a single screw hole. You can use that hole to mount the Electop virtually anywhere within a case, making the controller as easy-to-access or as out-of-sight as you wish. It’s worth noting how simple it is to setup all your fans with this controller, without leaving you to dig around in user manuals like with Corsair. For example, they’ve color-coded the fan headers. The red fan header is for your CPU, and is clearly labeled as such. And that kind of simplicity makes it easy to setup your fan controller in only a few minutes. The Electop Fan Controller looks like the barebones internal computer component that it is. It’s not going to be a great choice for someone who places any real value on the aesthetic of their components. Instead, the Electop Fan Controller is a highly practical, budget-oriented choice for a fan controller. It has more headers than you’ll need. The installation requires basically zero PC hardware experience. You can either use the optional screw hole, or the included sticky adhesive backing. But if you’re using the sticky solution, you might want to support the controller Velcro strips or a cable tie. The NZXT Sentry 3 is one full step above a basic fan controller, and one step below a high end fan controller like the Commander Pro. 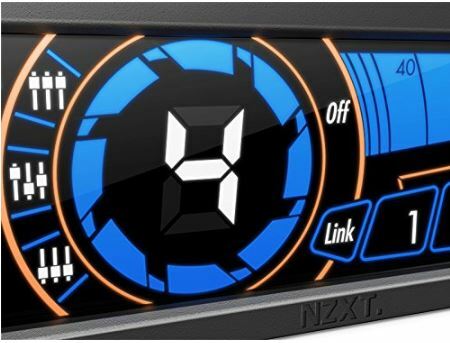 It has an approachable graphical interface that won’t leave you digging around in some program for your fan control, and allows you to check your temperature at a glance. But whether or not you like the NZXT Sentry 3 will come down to a matter of taste. That’s because this fan controller uses a highly unique design. 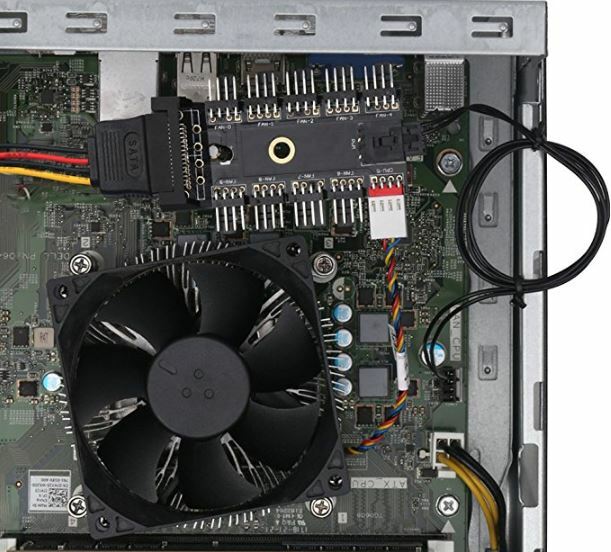 It’s built to the 5.25” optical drive form factor, and is intended to fit within a drive bay. That means it sits at 6.9 x 2.4 x 3.1-inchs, and weighs about 8 ounces. The touch screen is a full 5-inches, about one third larger than any other fan controller on the market. Apart from the capacitive touchscreen, the Sentry 3 is built from ABS plastic, PCB, and steel. As PC users abandon the use of optical drives, a fan controller is a natural replacement for increasingly unused drive bays. Figuring out how to setup the NZXT Sentry 3 is quite simple, thanks to the use of well-labeled arrows keys, and visual graphics to the current status of your system. You can even control your fans with a touch interface on the front of the Sentry 3. And a channel-linking feature lets you join up to five fans into one channel, so you can control them as a group. With the success of streaming services, people have stopped putting optical drives in their computers! With the exception of media machines made specifically for sitting in a home entertainment center, not many people use these drives anymore. Nevertheless, virtually all computer cases have them. That means the bright touchscreen LED used on the NZXT Sentry 3 will be a welcome sight for many cases. Moreover, the Sentry 3 was built with short protection, including protection for under voltage and overvoltage. So you don’t have to worry about frying your motherboard by running a ton of fans on boot up. 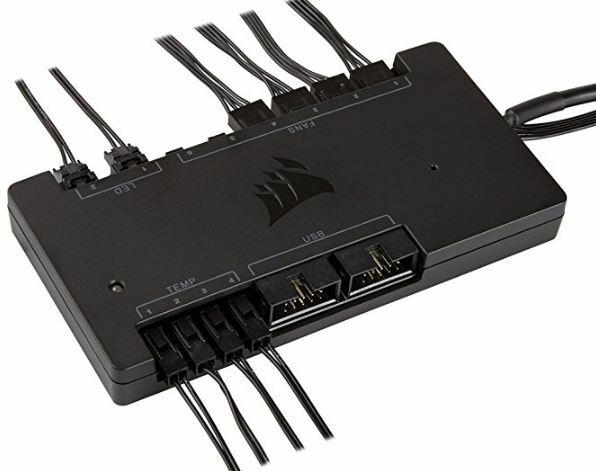 It supports both 3-pin and 4-pin connectors for a total of 5 separate channels of fan control. 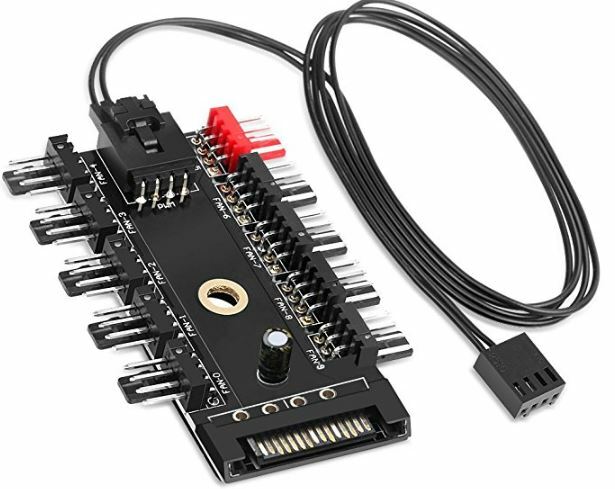 And it includes one Molex connector for power, one temperature sensor, and five PWM male fan connectors. The Electop Fan Controller is for people who want a highly practical and inexpensive choice. Fan controllers don’t have to be complicated. If you don’t need RGB lighting headers and a fancy plastic wrapper over the controller, then the Electop Fan Controller can provide quite a bit of value. As long as you don’t have to look at it through a case window, mocking you with its ugliness, it’s a great choice. Plenty of fan controllers you’re supposed to manually control end up on the back of the case, which makes them inaccessible in a huge variety of circumstances. And the NZXT Sentry 3 avoids that entirely. The NZXT Sentry 3 controller is a good choice for people who want accessible monitoring and control over their cooling system. It’s got an aesthetic you’ll either love or hate, that will either match or clash with the aesthetic of your case. But aesthetic aside, the Sentry 3 offers the best analogue control of a fan controller that you can buy. 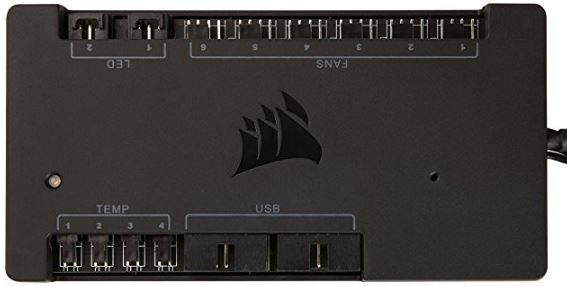 The Corsair Commander Pro is for people who want more out of their fan controller than fan control. The Commander Pro can manage and synchronize fan LEDs and case LEDs, while helping you keep detailed software-side control over your fan settings. And that’s without mentioning the temperature sensors, or the detailed RGB control you can get through Corsair’s software. The Commander Pro is the right choice for someone who’s building an aesthetic case. It’s also a highly practical choice for someone who wants to route more than just fans through their controller.